The global automotive HMI market size was valued at $14,807.4 million in 2017, and is projected to reach $33,590.4 million by 2025, registering a CAGR of 11.1% from 2018 to 2025. The central display segment was the highest contributor to the market, with $6,527.1 million in 2017, and is estimated to reach $13,725.6 million by 2025, at a CAGR of 10.0% during the forecast period. In 2017, Asia-Pacific accounted for the highest share in the global automotive HMI market analysis. The HMI system uses display units as a main component. HMI system is used as a communication medium for information and entertainment. The ADAS systems gather data from various sensors and showcases through display systems. The display systems help the driver in taking measures for better control of the vehicle. Increase in adoption of better interior for vehicles, rise in concern of consumer toward safety & security features, are the main factors that boost the growth of the automotive HMI market. In addition, growth in production and sales of vehicles in developing countries of Asia-Pacific is also influencing the automotive HMI market growth. The growth of the automotive HMI market share directly depends on the advancement of infotainment and communication systems. The global automotive HMI market is segmented based on product, technology, and region. Based on product type, the market is segmented into central display, instrument cluster, head-up display, and others. In 2017, central display segment dominated the market, in terms of revenue, and is expected to maintain this trend in the coming years. On the basis of technology, the market is categorized into visual interface, acoustic, mechanical, and others. Visual interface is expected to secure the highest share during the forecast period. Based on region, the market is analyzed across North America, Europe, Asia-Pacific, and LAMEA. In 2017, Asia-Pacific accounted for the highest share in the automotive HMI market and is anticipated to secure the leading position during the forecast period. All vehicle OEMs are focusing on enhanced capabilities on visibility and display of information for the driver. With rear seat entertainment, the overall entertainment facilities in vehicles are enhanced. With better connectivity and internet speed, HMI vendors are offering best-in class experience for drivers and passengers with mobile features, voice recognition and controls. The interactivity and communication of vehicles and humans have increased tremendously in the past few years. Moreover, consumer interest to connect multiple electronic devices in a vehicle are fueling OEMs to provide more features that allow connectivity to various electronic devices. For example, HARMAN can offer HMI with designs either from OEMs, tier-1 suppliers or HARMAN itself for instrument cluster system, complex 3D scenes development and multiscreen HMI solutions. All these elements help in providing relevant information helping the driver to focus on roads. 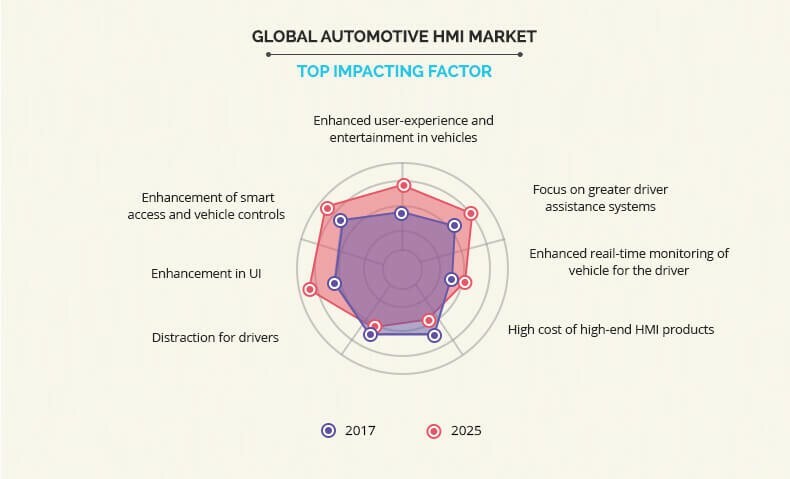 With increase in adoption of connected and autonomous vehicles, the automotive HMI industry is expected to witness greater emphasis on various ADAS and automotive HMI market segmentation to satisfy the vehicle customers as per automotive HMI market forecast. With the help of head-up display (HUD), the driver gets assistance in finding the road lines, thus helping in fog and rainfall. While designing the ADAS, the HMI visualization is an important criteria , as HMI and ADAS are expected to jointly enhance the capabilities of autonomous driving. ADAS communicates information to driver and HMI provides the interface for the communication between humans and vehicle. the ADAS transmits data or video collected by sensors through HMI display or an alert system detecting road condition or call for attention when there is a probability of collision and immediate collision avoidance operation is required. It is important for HMI developers to provide most reasonable and easy to access communication mode and UI for the driver to respond quickly. The automotive environment is changing at a rapid pace due to globalization. The increase in automotive sales has been caused due to the improvement in manufacturing facilities in most of the emerging countries such as China, India, and Brazil. Global automotive sector promises better productivity and sales as this sector consists of different segments such as passenger car and commercial vehicles, which in turn drives excellent profitability. This factor majorly influences prominent players of automotive sector to invest and expand the business through different segments to gain better profitability. Also, increase in disposable income of consumers and surge in car sale across the globe fuel the rise in sale of automotive vehicle. Developing countries such as India, China, and Brazil, are the most promising countries for the automotive sector. China, being the world’s largest market for vehicles, is expected to grow further over the next few years as most OEMs are also making large investments in this sector. 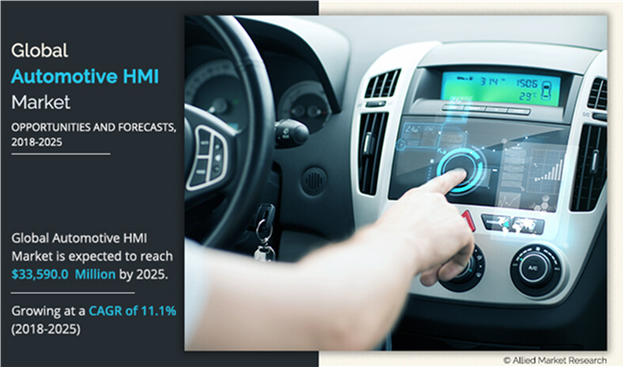 Along with China, the U.S. automotive HMI market is also anticipated to grow in the near future. High cost of advanced HMI systems pre-installed in vehicles are restricting the adoption of HMI among cost-sensitive consumers. The cost of the display and touchscreens make HMI costlier than the earlier used analog instrument clusters. Moreover, many vehicle OEMs are focusing on integrated central displays eliminating the instrument clusters behind steering. The manufacturing cost of primary display systems that provides an integrated view of car components and also a medium for ADAS visualization for safer driving. The head-up display (HUDs) are high-cost HMI products but is expected to grow substantially during the forecast period. The increasing adoption of ADAS and safety features are expected to fuel the growth momentum of HMI market. However, the high cost of rear-seat entertainment and HUDs are restricting the growth of automotive HMI market. In recent years, consumers have shifted their interest to automotive vehicles, as these vehicles do not consume any kind of fuel such as petrol, diesel, or gasoline and are technologically advanced as against traditional vehicles and cost low amount of maintenance, and thereby reduce the customer’s expense. With increasing adoption of autonomous vehicles, the emphasis on connected vehicles and infotainment for drivers and passengers have increased. Moreover, the information related to safe driving and surround view of the vehicles are being focused for the OEMs. Most OEMS are looking to leverage the HMI systems to enhance the interiors of the vehicles as well. The evolution of display systems are expected to impact the automotive HMI market trends. 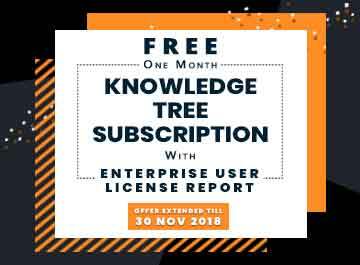 Such rise in the sales of the autonomous vehicles due to their advanced features is expected to create numerous automotive HMI market opportunity. Key players operating in the global automotive HMI market are Continental AG, Robert Bosch GmbH, Panasonic Corporation, Visteon Corporation, Alpine Electronics, Inc., Clarion Co. Ltd., Nuance Communications, Inc., Samsung Electronics Co. Ltd. (Harman International Industries, Inc.), Nuance Communications, Inc., and Valeo. This study presents analytical depiction of the automotive HMI market analysis along with the current trends and future estimations to depict the imminent investment pockets. The overall automotive HMI market potential is determined to understand the profitable trends to gain a stronger foothold. The current automotive HMI market is quantitatively analyzed from 2017 to 2025 to benchmark the financial competency. The HMI system uses display units as main component. The HMI products are communication channels for drivers and passengers with the vehicle. The HMI products are used for in-vehicle information and entertainment purposes. The sensors integrated in vehicles capture various images, videos, and data of the surroundings, which are displayed or notified via the HMI systems. The HMI products are evolving with touchscreens, voice controls, gesture recognition, and others. Furthermore, betterment of vehicle interiors is also driving the automotive HMI market. Increase in adoption of HMI system for vehicles and rise in digital information display toward safety & security features boost the growth of the automotive HMI market. In addition, growth in production and sale of vehicles in developing countries of Asia-Pacific is also influencing the growth of automotive HMI market. The growth of the automotive HMI market directly depends on the advancement & expansion of infotainment system. Among the analyzed regions, currently, Asia-Pacific is the highest revenue contributor, and is expected to remain dominant during the forecast period, followed by North America, Europe and LAMEA. This growth is attributed to increase in demand for various types of vehicles.